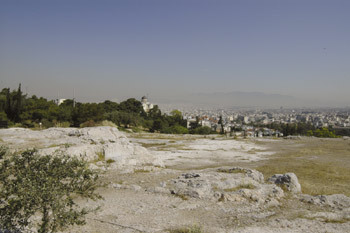 The function of the large, theatre-like area on the hill west of the Acropolis had, in the past, been explained by a number of different theories, before it was securely identified as the Pnyx, the place where the Assembly of the Athenians held its meetings. The remains found have shown that the Pnyx had three main building periods. In the first period, the natural hillside was used as the cavea of the theatre. The surface was evened off by quarrying out the hard limestone, while a straight retaining wall was built on the north side. In the second period, the arrangement of the auditorium was very different; a high, semicircular retaining wall was built to the north, supporting an embantment sloping down to the south, that is, in the opposite direction comparing to the first period. The approach was through the two stairways, 3.90 m. wide. The Pnyx of the third period had exactly the same plan but on a larger scale; the great retaining wall was constructed of large stone blocks quarried from the area, while the new bema was arranged to the south. 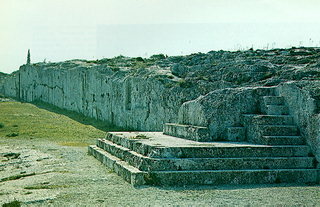 In 88 BC at the latest, the Pnyx was abandoned and the Assembly of the Citizens congregated at the theatre of Dionysus.